^ Baikonur Cosmodrome 45.9 N 63.3 E. FAS.org. Federation of American Scientists (FAS). [19 July 2014]. ^ Space Station Assembly: Baikonur Cosmodrome. NASA. [2017-03-16] （英语）. This misrepresentation was done intentionally to hide the actual location of the launch complex. 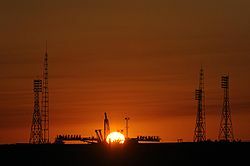 ^ Baikonur Cosmodrome. NASA. [24 December 2011]. "Testing of rocket and space technology – the business of my life" Events and facts – A.I. Ostashev, Korolev, 2001. "Look back and look ahead. Notes of a military engineer" – Rjazhsky A. A., 2004, SC. first, the publishing house of the "Heroes of the Fatherland" ISBN 5-91017-018-X.